The small maisonette had originally been carved from a large villa by infilling the side passage between the adjacent building. As such the cramped and awkwardly arranged property had a disproportionately large garden for it’s size, albeit underused due to a 1.5m difference from ground floor level at the rear giving poor access. 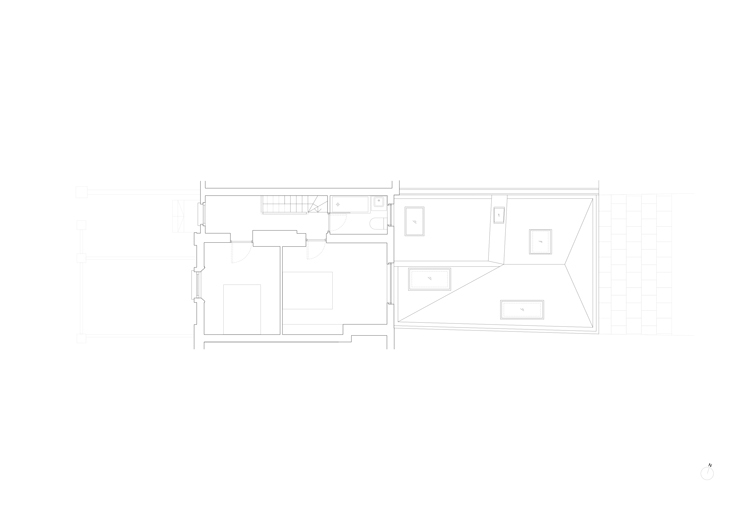 The client's brief was to connect the house to the garden and to provide additional space for their growing family in the form of a new kitchen-dining room, study-guest bedroom and shower room, as well as an enlarged first floor bedroom. To address conservation area concerns they wanted the extension to appear ‘in keeping’ with the original building and to not feel overly exposed to the garden. The extension sought to create a more visually consistent rear façade which asserts the property as a component of the terrace rather than an appendage. Set behind a simple rigorous brick facade the design placed the kitchen at garden level, wrapping it around the raised study and connecting it to the ground floor living room with wide steps. Considered as a series of ‘terraces’ all rooms are interconnected but can be separated via sliding doors and internal shutters. The interior unfolds as a series of geometrical white planes held by a complex folded roof structure; the outcome of planning restrictions on the massing and boundary heights and a desire to maintain views to the garden from every room. The formality of the rear elevation juxtaposed with the sculpted internal space creates a dynamic and changeable addition, doubling the size of the property.